Actinic keratoses (AK). These are abnormal growths resulting from overexposure to UV rays. AK are considered pre-cancerous and, if left untreated, they can develop into squamous cell carcinomas (SCC). The appearance of AKs is rough and scaly, and they can be tan, red, pink or flesh-colored. Studies show that up to 60% of SCC begins as AK.1 They can be treated by physicians in several ways, including cryosurgery (freezing of the lesions), curettage (scraping of abnormal surface tissue), 5-aminolev­ulenic acid photodynamic therapy (PDT), surgical excision and topical destructive cream medications. Clinical studies have also shown chemical peels, such as Jessner’s solutions and trichlor­oacetic acids (TCA) preparations, to be effective treatments as well. Squamous cell carcinoma (SCC). This has a red, rough or flaky appearance and often causes thickening of the skin. Ulcerations may occur and cause a chronic open sore. SCC primarily affects the superficial layers of the epidermis and approximately 97% of SCC does not spread; however, if metastasis does occur, scarring, disfigurement or death is possible. 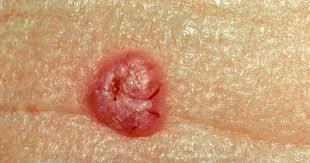 Basal cell carcinoma (BCC). They can be as simple as a tiny, clear, pearly or flesh-colored bump or may be more apparent, such as an open sore or shiny red, pink, brown or black lesion that can be mistaken for a mole. Although BCC is considered the least threatening form of skin cancer because it grows the slowest and is the least likely to metastasize, or spread, it can be incredibly locally destructive or disfiguring. 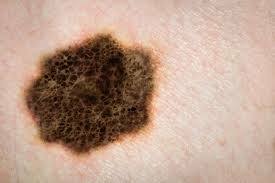 Melanoma. 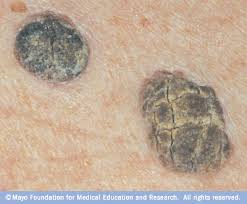 This is a dark-colored cancer of the skin’s pigment-producing cells, known as melanocytes. This is the most dangerous form of skin cancer due to its ability to metastasize and spread to lymph nodes, blood, distant tissues and organ systems. If detected and treated early while it is still thin, melanoma can typically be cured. 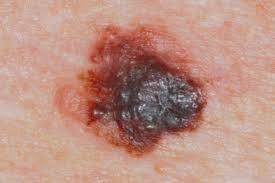 Once it spreads, melanoma can be extremely difficult to treat and often leads to death. If a mole presents any of these characte­ristics, or if it changes in size, shape, color or texture, it should be emphasized to the client to have it evaluated by a dermatologist in the near future. The following skin concerns are completely benign. Although they will not cause harm, many require special treatment consider­ations. Many of these harmless lesions look similar to skin cancers; therefore, it is important that nonphysician skin care professionals have their clients properly diagnos. Seborrheic keratoses (SK). 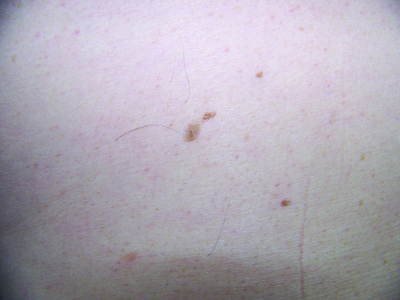 These are typically dark-colored lesions that appear to be stuck on the surface of the skin. They are waxlike and often have a rough, uneven texture. SK are considered to be the most common noncancerous dermatol­ogical concern. They can be found anywhere on the body, but are more commonly found in sun-exposed areas. SK are not contagious and although their exact cause is unknown, they seem to be linked to heredity. Studies show that, although patients with SK can develop skin cancer and SK can look strikingly similar to skin cancer, this type of keratosis does not progress into a cancerous lesion.5 SK should be removed by a physician using electroc­autery (burning the lesion with electric currents), cryosurgery or curettage. Treatment with chemical peels or microder­mabrasion will not cause harm; however, complete clearance of SK is not typically possible with these methods of treatment. Sebaceous hyperplasias. These result from an abnormal enlargement of the sebaceous gland and are thought to affect nearly 1% of the U.S. population.6 These yellow or orange lesions are most common on the forehead, nose and cheeks because of the abundance of oil glands in these areas of the face. 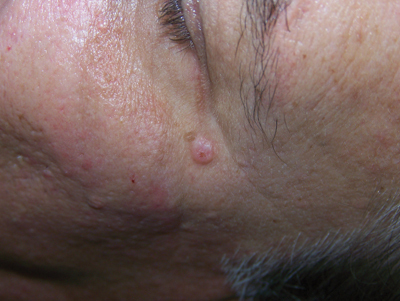 Sebaceous hyperplasias can be mistaken for BCC due to their raised, nodular, bumpy appearance. The term hyperplasia describes the abnormal buildup of cells. They are believed to be caused by the decrease in cell turnover associated with the aging process. Sebocytes, or cells that form the sebaceous glands, mature and then eventually dissolve, releasing oily sebum. 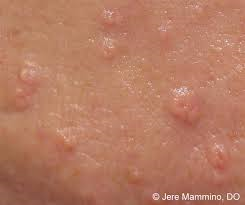 Sebaceous hyperplasias form when these sebocytes do not break down and, instead, crowd the oil gland, causing it to expand. Research indicates that sebaceous hyperplasias are not linked to skin carcinog­enesis in any way.7 There are several treatment methods available, including cryotherapy, electroc­autery, curettage, laser treatments, phytodynamic therapy, and topical treatment using TCA acid and retinoids. Sebaceous hyperplasia may reoccur if not completely removed. Cherry hemangiomas. 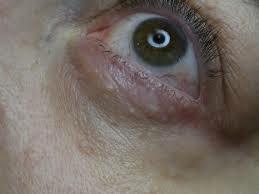 These are caused by an abnormal gathering of dilated small blood vessels called venules. This type of lesion is typically small and round and ranges in color from bright red to purple. They can be smooth or raised to the touch. The probability of developing cherry hemangiomas increases with age, and they can appear anywhere on the face or body. There is no link between cherry hemangiomas and skin cancer; however, some more vascular BCC and SCC can have a similar appearance to this common vascular lesion so a physician should always be consulted for proper diagnosis. Cautery and light therapy treatment are the best options. With these types of treatments an electrical hyfrecator, or laser or intense pulsed light (IPL) beam cauterizes the vascular lesion, causing it to disintegrate. Keratosis Pilaris;Typically, keratosis pilaris patients present with a scattered, patchy rash made of very small red or tan bumps. Often, anywhere from 10 to hundreds of very small slightly rough bumps are scattered in an area. The affected area may have a fine, sandpaper-like texture. Some of the bumps may be slightly red or have an accompanying light-red halo indicating inflammation. Keratosis pilaris may cause bumps on the backs of the upper arms ,Overall, keratosis pilaris is a chronic skin condition periodically becoming worse or better. 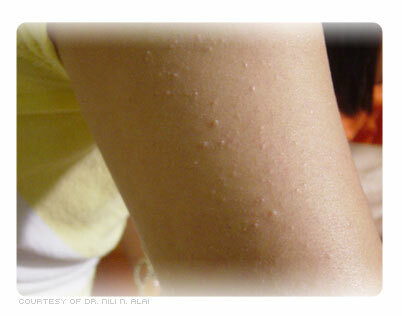 Keratosis pilaris is a benign, noncontagious, self-limited skin condition that tends to be mild. 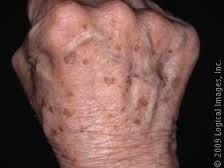 Keratosis pilaris frequently improves with age in many patients. Many patients note improvement of their symptoms in the summer months and seasonal flares in colder winter months. 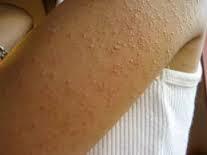 More widespread, atypical cases of keratosis pilaris may be cosmetically distressing. Lentigines, or liver spots, are benign lesions that occur on the sun-exposed areas of the body. The backs of hands and face are common areas. 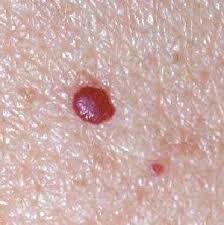 The lesions tend to increase in number with age, making them common among the middle age and older population. They can vary in size from 0.2 to 2 cm. 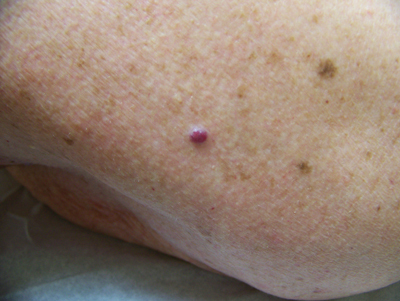 These flat lesions usually have discrete borders, are dark in color, and have an irregular shape.